There's so much more than country music and cowboy boots. If you love music and you’re planning a trip to the United States, Tennessee might not automatically register as an essential travel destination, but the south-eastern state’s capital Nashville actually boasts a wealth of delights that arguably make it the greatest music city in the world. While the state is stereotypically viewed as cattle country and the buckle of the bible belt, Nashville’s music scene breeds a level of cultural complexity extending far beyond #demcowboyfeels. 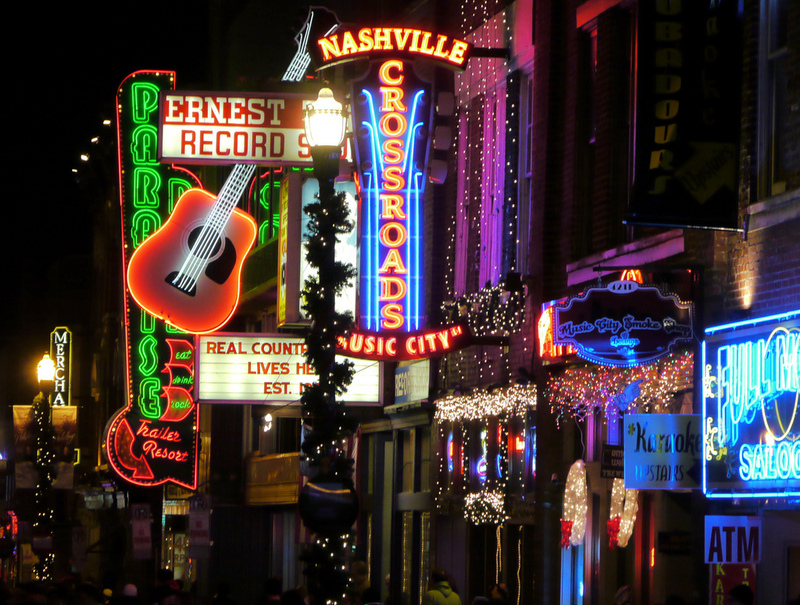 While country music is indeed a powerful presence in the so-called “Music City”, Nashville strives to cater to fans from all genres, with blues, rock and folk also putting in a strong show for the historical limelight. Acts like Kings of Leon, Ben Folds, The Black Keys and Johnny Cash all spent significant time in Nashville furthering their careers, along with country stars Willie Nelson and Dolly Parton. The live music scene is actually so vast and varied that it can keep you busy from dusk ’til dawn, plus the city itself is endowed with enough history and beautiful scenery that it should definitely rank on your to-d0 list. Here’s why music lovers should put it on their radar. A personal preoccupation with or professional tie to music and music-making is inherent to life in Nashville (as any local will enthusiastically tell you). Wearing the moniker “Music City” with pride, those you encounter will scurry to explain that the city’s scope extends far beyond the country music boundaries you may believe it is limited by – a commonly repeated boast is that the city can offer you live music according to whatever obscure taste is tickling your fancy, in addition to providing countless venues to cover the more familiar and mainstream categories. Indeed, live music is the lifeblood of the city, with the city’s claim to fame being that there is live music available 24 hours a day, seven days a week, 365 days of the year, with much of it for free. The Music City Marketplace offers free events every Wednesday, and Nashville’s Free Live Music App can point you in the right cost-effective direction. This direction will lead you to places like Honky Tonk Highway with its many saloons, the late night blues and rock’n’roll venues of 2nd Avenue, or even along to Music Row (the industry heart of Nashville) which hosts hundreds of music-related businesses including record labels, radio stations, recording studios and music-based magazines (as well as live music venues, naturally). Nashville is also a great city to write a song. Writers the world over head here to hone their craft. Many live music venues will host songwriter nights, which are also often free of charge. While common courtesy may be a totally foreign concept to your local hyper-cool barista, when you’re Stateside Southern hospitality is a very real a thing. Prepare for doors to be opened, hands to be extended and help to be offered, all with a side of adorable Southern twang and, in Nashville, a pair of oh-so-fabulous colourful cowboy boots. While you’re drinking in all of the musical offerings the city has in store, why not further quench your thirst through the city’s strong local craft beer scene – or better yet, head an hour and a half out of town and visit ol’ Jack Daniels distillery in Lynchburg. If you’re thirsty you’re probably hungry too, and no Southern adventure is complete without classic American barbecue, which Nashville has in spades. Pulled pork naturally abounds here, along with its culinary compadres of fried chicken, marinated ribs, and upscale hotdogs – grab yours in East Nashville at a roadside vendor delightfully named I Dream of Weenie which is housed in a yellow Volkswagen and serves some of the finest chargrilled dogs in the city. If you’re done with all the drinkin’, eatin’ and dancin’, Nashville’s Centennial Park has a fun art gallery housed in a full-scale plaster copy the 438BC Athens’ Parthenon (for some reason), while the neighbouring Bicentennial Capitol Mall State Park contains a timeline that traces the history of the earth, the country and the area, making for a lovely afternoon stroll if you’re in need of a little quiet time. Finally, if you’ve run out of things to do in Nashville (and this will take you a while), the city’s geographic location is within a wider musically-rich nexus, surrounded by state neighbours with as many valuable and varied musical offerings as the Music City itself. For instance, a couple of hours south on a cheapie Greyhound will take you to Memphis – the self-proclaimed “Home of the Blues and birthplace of Rock‘n’Roll,” which honours each genre’s greats via plaques, clubs and memorials strewn throughout the city and the Beale Street party area. Memphis is also where you’ll fine Elvis Presley’s Graceland ranch, his former home-turned-museum that provides an unforgettably kitsch foray into the outlandish personal and professional life of the King – you’d be crazy to skip in, even if you’re not a fan. Finally, of course, no trip to the South is complete without a visit to the magnificent New Orleans – a city unlike any other, unparalleled in its cultural variety and truly a global gem that can lay claim to cultivating and curating jazz music as we have come to know it. Indeed, any wander around the Big Easy’s French Quarter is accompanied by the unmistakable sounds of trumpets wafting out from some of the country’s (if not the world’s) most reputable jazz bars and clubs. It’ll be music to your ears. Qantas flies directly to Dallas, a gateway to the southern United States.